This past Thursday evening, May 21, we went before the Hancock County Planning and Zoning Board with two site plans for proposed buildings on our church property and to request and extension for our temporary structures while construction continues. The first site plan presented to the board showed our next building we plan to construct. Affectionately referred to as “The Mercy House,” this building will serve our ongoing and expanding mercy ministry. We already have a thriving ministry to our community through providing food, clothing, household items and other tangible help to those in need. We want to expand this ministry to also include things like financial management seminars, drug and alcohol addiction intervention and mitigation, biblical counseling, and other things. The 2080 square foot building will need to sit approximately 11 feet off the ground in compliance with the new flood zone regulations. This construction allows for the inclosure of the bottom section to be used for storage of the items distributed through the ministry. The main level will include a small kitchenette, restroom, closet space, and one large multipurpose room. 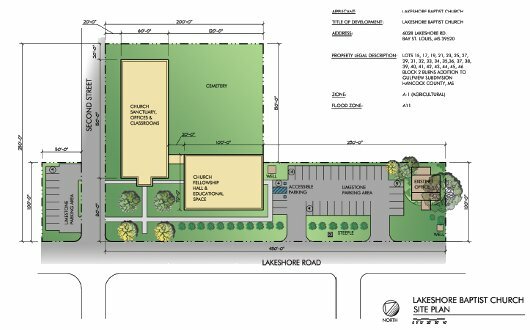 The building will be located across the street from the church at the corner of Lakeshore Road and Third Street. For those familiar with our property, you can see our existing office on the far right. We plan to remove the metal building currently being used for our worship space and replace it with a parking lot. The fellowship hall will sit in front of the current “distribution center” housed in the two quonset huts. Removing the huts will allow us to reclaim our existing cemetery. The main church building, including the sanctuary will run along Second Street, in place of our camp kitchen. The board also unanimously approved this plan. We will now move forward will all the particulars of designing these buildings. They too will need to sit approximately 11 feet off the ground. I envision inclosing the bottom sections so that the structures look more like two story buildings rather than structures awkwardly sitting atop stilts. Connecting the two buildings on the upper level will provide easy access between the two. Please pray for us as we hammer out the details of these buildings. As many of you reading this know, after the storm we opted not to rebuild immediately, instead turning our attention to the needs of our community. As we ministered help an hope in the name of Jesus Christ, we focused our efforts on placing others before ourselves. At the same time we wanted to wait for the appropriate time where we could devote the attention, forethought, prayer and planning that we believe that God’s building design deserves. Keep up with us as these exciting plans develop. Earlier this week we were refused a place on the docket to request an extension of our permit for the temporary structures on our church property. If you recall, in the January meeting the board gave us until May 31 to remove all temporary structures. Since then we have begun building a bunk house and have the above site plan ready to move forward for our other facilities. In the meantime, we need to keep our temporary buildings while we construct our permanent ones. A quick conference with the Planning and Zoning Commission lawyer produced a legal mechanism where she allowed us to request the extension in the meeting. (Praise the Lord for Attorney Rachel Perniciaro.) The board voted 3-2 against us, but this ruling opened the door to an appeal to the Board of Supervisors. We have 10 days to make this appeal and have already begun the ground work. We pray these actions will give us enough breathing room to not miss a beat in the ongoing relief, recovery, and rebuilding efforts to the glory of God. Our prayers continue that doors will remain open @ Lakeshore Baptist for the ongoing relief, recovery + rebuilding of Hancock County.